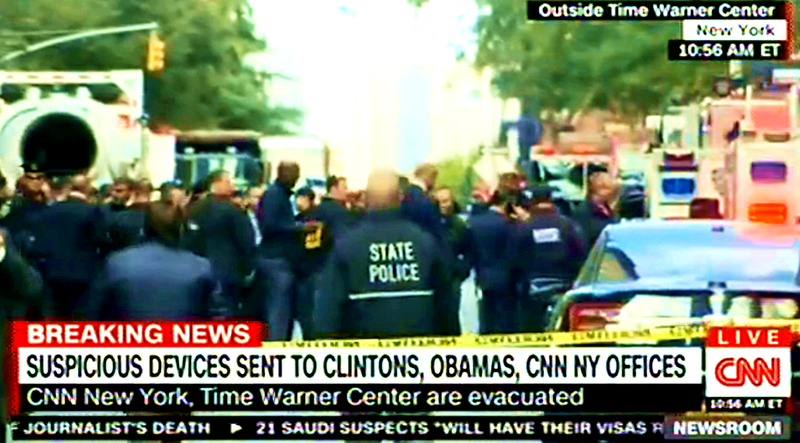 CNN’s offices in New York have been evacuated over reports of an explosive device. 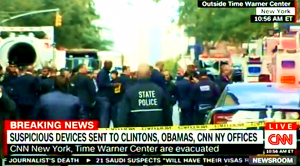 It comes after the US Secret Service said it agents had intercepted suspicious packages addressed to former president Barack Obama and Hillary Clinton. Video posted on social media showed the moment CNN was forced to cut from its live broadcast, with one of the presenter’s telling viewers a fire alarm had gone off. MSNBC reports that the device at CNN was addressed to former CIA director and regular CNN contributor John Brennan. Additionally, they have reported that their law enforcement sources say that the devices are very similarly constructed and may well be from the same malefactor. Keep in mind that preventive measures and investigative methodology has come a long way since the Unabomber undertook his postal killing spree. Don’t be surprised if there is an arrest by the end of the week.